Every now and then we come across other sumps that have been re-vegetated. They all are a great source of inspiration. If you are aware of others, please let us know. 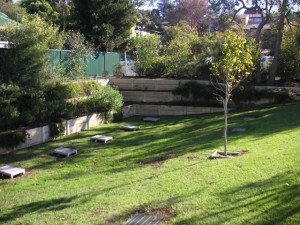 Our idea is not new, not even for the Town of Victoria Park. A long time ago a resident of the Town of Victoria Park already had the idea to re-vegetate the sump close to his house on 10 Gemini Way in Carlisle. We obviously had to take a look when we were told about it and found a sump which is now home to native vegetation and mature trees. 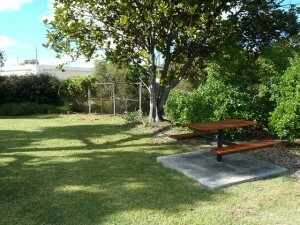 There is even a picnic bench inviting visitors to sit down for a while, relax and enjoy the surrounds. 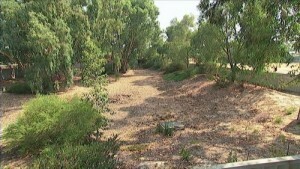 The Town of Claremont has also re-vegetated a number of its storm water drainage sites. They are scattered around the suburb. Here is an images of one of them on the corner of Barnfield Rd/Grange St, providing another example of what is possible.